Decrypt all the hard drives before the update. Kaspersky Anti-Virus 6.0 for Windows Workstations MP4 CF1 (6.0.4.1424), MP4 CF2 (6.0.4.1611). Kaspersky Anti-Virus 6.0 for Windows Servers MP4 CF1 (6.0.4.1424), MP4 CF2 (6.0.4.1611). Kaspersky Endpoint Security 8 for Windows (8.1.0.646), CF1 (8.1.0.831), CF2 (8.1.0.1042). 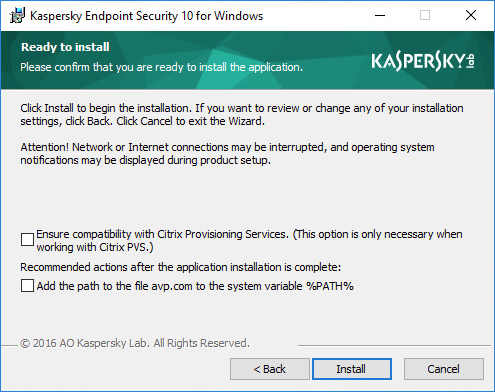 Kaspersky Endpoint Security 10 SP1 for Windows (10.2.2.10535). Kaspersky Endpoint Security 10 SP1 MR1 for Windows (10.2.2.10535(MR1)). Kaspersky Endpoint Security 10 SP1 MR2 for Windows (10.2.4.674). Kaspersky Endpoint Security 10 SP1 MR3 for Windows (10.2.5.3201). Kaspersky Endpoint Security 10 SP1 MR4 for Windows (10.2.6.3733). Local upgrade through the installation wizard. Local upgrade from the command line. Remote upgrade through Kaspersky Security Center 10. Remote upgrade through the group police management editor. The previously installed version is removed automatically during upgrade. Information about activation and product settings are saved and applied during installation of the new version. To apply the changes, restart the computer when the installation is completed. For activating the new version, use the key file for the previously installed version. Contents of quarantine and backup are not saved during upgrade.